The sitcom, created by Jonathan Butler and Gabriel Garza, features a cheerleader, Bella Dawson (Bassinger) who becomes the quarterback of her school’s football team. The Bella and the Bulldogs TV series cast also includes Coy Stewart, Jackie Radinsky, Buddy Handleson, Lilimar, and Haley Tju. What do you think? 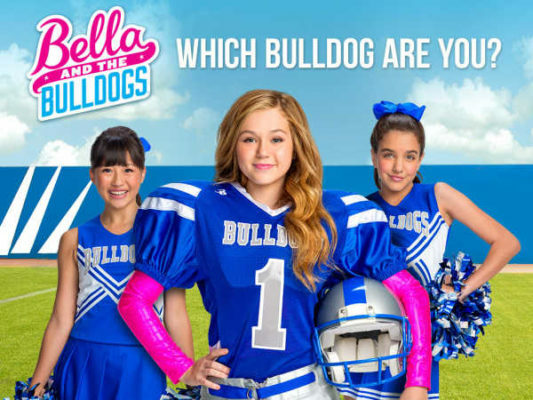 Are you a fan of the Bella and the Bulldogs TV series? Do you think it is ending at the right time, or should it have been renewed for a third season? Please make a season three love this show!!!!! they should of done about 4 more season becuase they should end it when they finish highschool wacth the last episode at the end they were talking about highschool i love the show so much. MORE BELLA AND THE BULLDOGS!!!!!!!!!!!!!!!!!!!!!!!!!!!!!!!!!!!!!!!! Bella and the Bulldogs needs to come back. The way it ended left many viewers, including myself, wondering what would happen in high school. The show was even hinting at that there would be another season. Bring Bella and the Bulldogs back! They always seems to end the good shows on Nickelodeon. First The Haunted Hathaways and now Bella. These were good shows for the kids, nice, clean and fun. We are all devastated. This is totally unfair!